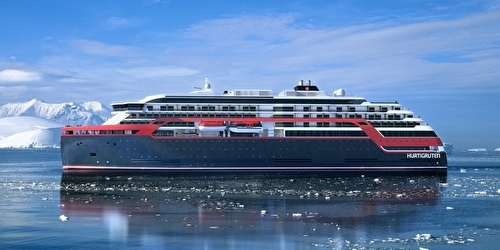 MS Roald Amundsen is the first of two hybrid ships Hurtigruten will add to its fleet over the next few years, cutting emissions by sailing with electrical propulsion. Hybrid technology, combined with the advanced construction of the hull and effective use of electricity on board will reduce fuel consumption and CO2-emissions on the ships by 20 percent. The build of these two ships represents the largest single investment in the history of Hurtigruten. The future of shipping will be silent and emission free. MS Roald Amundsen will lead the way towards an even more sustainable way of traveling. Sailing on electrical power is not only a great benefit for the environment, but it will also enhance the impact of experiencing nature for the guests. The ship will be specially constructed for voyages in polar waters and serve as a comfortable basecamp at sea – bringing adventurers from all over the world to the most spectacular destinations in the most sustainable way. 14 night cruise sailing from Lisbon aboard the MS Roald Amundsen. 13 night cruise sailing from Lisbon aboard the MS Roald Amundsen. 14 night cruise sailing from Hamburg aboard the MS Roald Amundsen. 10 night cruise sailing from Hamburg aboard the MS Roald Amundsen. 6 night cruise sailing from Tromso, Norway aboard the MS Roald Amundsen. 11 night cruise sailing from Oslo aboard the MS Roald Amundsen. 13 night cruise sailing from Longyearbyen aboard the MS Roald Amundsen. 15 night cruise sailing from Reykjavik aboard the MS Roald Amundsen. 28 night cruise sailing from Vancouver aboard the MS Roald Amundsen. 23 night cruise sailing from Copenhagen, Denmark aboard the MS Roald Amundsen.